Russian Women Prove It's Hip To Be A Babushka A group of babushkas, or elderly women, who live in Buranovo, Russia, have become a musical sensation. They sing Beatles tunes and songs by iconic Russian rocker Viktor Tsoi. They fly around the country for concerts. And it all started because they turned to music during tough times. The "Buranovo Babushkas" watch video, for the first time, of two of their members appearing on Russia's Who Wants to Be a Millionaire? program. In Russian culture, one iconic image is the elderly woman — in Russian, she's called a "babushka" — sitting on a roadside, selling vegetables from her garden. 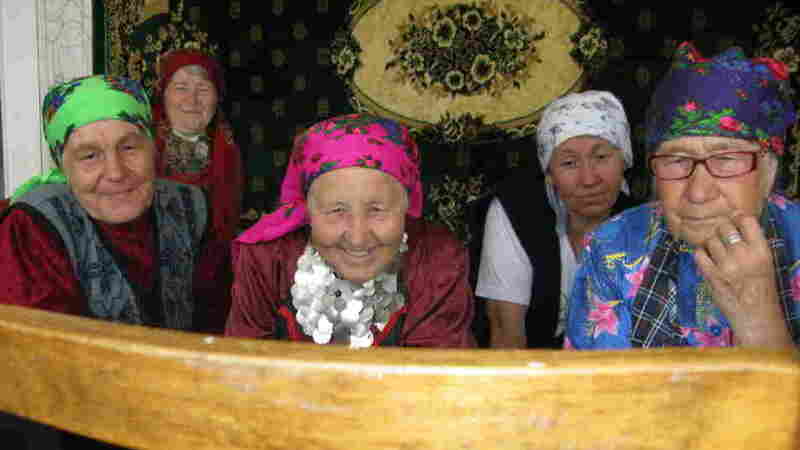 As modern as these women appear, the "Buranovo Babushkas" do also embody one sad reality of Russian life. Watch the babushkas in the Russian finals of the Eurovision music contest. "After I lost my husband, I received some kind of gift — the ability to compose music," Zarbatova said in a recent interview in her village. "The music comes from the heart. The suffering comes right from my heart." We can't lose heart, or get depressed. Life goes on; it's impossible to stop. That's what we sing. "It was my sweater," she recalled. "Somehow it took the sleeve of my sweater." Her prosthetic arm is too heavy for her to wear all the time. She saves it for concerts, where she's singing, smiling and dancing. "I'm an optimist," Pyatchenko said. "You'll never hear me complain." And there's Galina Koneva, 72. She lost her husband in 2004 to drinking and diabetes. "We can't lose heart, or get depressed," Koneva said, before bursting into a song she knows from church about life moving on. "Life goes on; it's impossible to stop," Koneva said. "That's what we sing." The women live in Russia's Udmurt republic, home to people who speak a language that is much closer to Finnish than Russian. 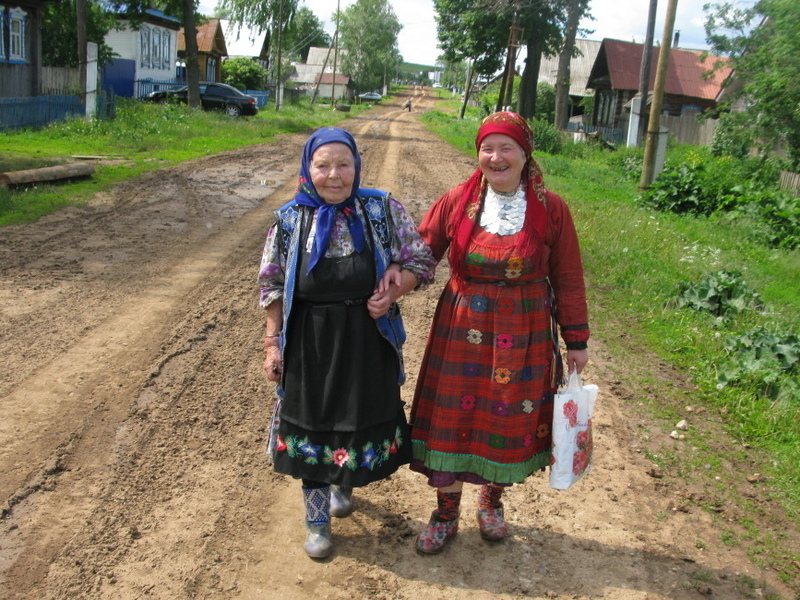 Elizaveta Zarbatova (left), who walks with Alevtina Begisheva, is the oldest member of the group at 84. She was widowed in 1957 when her husband was electrocuted on the job. "After I lost my husband, I received some kind of gift – the ability to compose music," she says. "The music comes from the heart. The suffering comes right from my heart." The babushkas took songs like "Let it Be" and "Yesterday" by the Beatles and "Hotel California" by the Eagles and translated them into Udmurt. YouTube videos of the group went viral. And they grabbed the attention of the organizers of Russia's Eurovision finals. "Many people say Russia, it's Kalashnikov. And Udmurt republic is Kalashnikov, too," he said. "Now, I think it's Buranovo Babushkas — best brand in our republic!" The babushkas have gotten themselves a producer in Moscow who books gigs for them. They donate most of the small amount of money they make to try to rebuild a church in their village that was destroyed in Stalinist times. This year so far, they've raised $4,000 for the church. As for what's next? The babushkas say they have another Eurovision run in them if the organizers come calling. Mostly, though, they're just having fun on the road, and enjoying each other's company.